A forum for authoritative articles of current music therapy research and theory, Journal of Music Therapy, seeks to advance research, theory, and practice in music therapy through the dissemination of scholarly work. Arts Based Research offers a new and diverse method for inquiring about the world around us. Whether examining social sciences or healthcare, this field offers a different approach and establishes an innovative framework for inquiry. We spoke with Professor Jane Edwards, the guest editor for a special issue of the Journal of Music Therapy, about her perspective on this emerging field. How did you get involved in Arts Based Research (ABR)? As a young academic I spent a lot of time thinking about how music and health intersected, not just through my discipline and profession of music therapy but more broadly within everyday life and in related disciplines such as neuroscience, sociology, and psychology. As my interest grew I founded a research group at the University of Limerick launched by Professor Even Ruud of the University of Oslo. How did the Music & Health Research Group get started? This research group was initially comprised of myself, Dr Simon Gilbertson (now at University of Bergen), and Dr Alison Ledger (now at University of Leeds). The group hosted many international meetings including the European Science Foundation funded Music and Health meeting in in 2004, and in 2009 the meeting at which the International Association for Music & Medicine formed. This quickly became a highly active organization for interdisciplinary exchange about all aspects of music in healthcare with biennial conferences in countries around the world. As the Music & Health Research Group expanded and then dispersed, with members moving to new work in many countries, multiple opportunities to think about how and where the arts belong in social sciences research were engaged. We continue to find inspiration and support for a range of new concepts and practices. What is the current state of Arts Based Research (ABR)? ABR has found a place in many social science and healthcare research endeavors. ABR involves engaging the potential fun and playful messiness of the arts within a constructivist sensibility opening out into new experiences that inspire the creative potential of our humanity. At its core ABR acknowledges that there is an important place for research methods that can facilitate and honor thinking, feeling, and reflecting for all research participants, including the person developing the research and the people who participate or co-research with them. This orientation within the ABR epistemology and practice offers a way to bring multiple perspectives into research processes, and to deepen reflection on data and findings. In the midst of all this playful messiness, novel insights and new dynamics of scholarship are engaged. Drs. Ledger and McCaffrey address the current state of ABR with four questions: (1) When should the arts be introduced? (2) Which artistic medium is appropriate? (3) How should the art be understood? (4) What is the role of the audience? Arts Based Research (ABR) integrates the potential fun and playful messiness of the arts with a constructivist sensibility open to new experiences in the creative potential of our humanity. What could be more exciting than integrating and honoring the multiple ways human knowing and perceiving can be explored, represented, and enacted? The Hands by Simon Gilbertson in Journal of Music Therapy, 2015;52:487-514. © the American Music Therapy Association 2015. All rights reserved. What is the relationship between music therapy and Arts Based Research? Music therapy as a profession has lagged behind engagement with ABR. One possibility is that music therapy professionals can experience social status anxiety (Cameron, 2014; Edwards, 2015). It can therefore be difficult embrace the creative and seemingly less scientific option of ABR. As Einstein and Forinash (2013) have noted ABR can be challenging because of the, “[f]ear that art is not enough and will not be understood” (p. 84). I suggest that many music therapists would love the expansion of opportunities for reflective research practice ABR offers, and have much to gain in entering this conversation. What could be more exciting than integrating and honoring the multiple ways human knowing and perceiving can be explored, represented, and enacted? How is Arts Based Research applicable in a practitioner setting? Professor Simon Gilbertson’s work is a great example of creative engagement with ABR through his research study of practitioner experiences. During one interview, clinicians’ hands were submerged in an alginate solution and cast in the position that they recalled from that prior moment. I found myself wondering what the Institutional Review Board thought of his ethics application. Another great example is Dr McCaffrey’s doctoral research. New researchers will likely appreciate the problem solving which is described when encountering uncertainty within the research process, and the ways in which arts based methods offer a pathway through to remaining engaged and open to the experience of a research participant. You are serving as a guest editor for a special issue on Arts Based Research for the Journal of Music Therapy. What did you consider when approaching this issue? 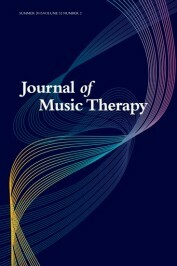 Accepting a recent opportunity to serve as guest editor for the Journal of Music Therapy, the first music therapy journal to focus an entire issue on Arts Based Research (ABR), gave me an opportunity to call upon my colleagues and showcase some of the aspects unique to this way of researching. Music therapy has opportunities for great gain in entering this conversation, not by leaving anything behind but integrating and honoring the multiple ways human knowing and perceiving can be explored, represented, and enacted. ABR integrates the potential fun and playful messiness of the arts with a constructivist sensibility open to new experiences in the creative potential of our humanity. This special issue of the Journal of Music Therapy (Volume 52, Issue 4) elaborates broad concepts for the arts as foundational processes within research inquiry. Featured image: Colorful G-clef. (c) proksima via iStock. Jane Edwards, PhD RMT, is an Associate Professor in Mental Health at Deakin University, Victoria, and is the inaugural President of the International Association for Music & Medicine. She is the guest editor for a special issue on Arts Based Research for the Journal of Music Therapy. I think that there should be more aspects to understand that the interaction of color music are a quest to be open minded. This is the direction to gain or regain a natural wholeness and health. I am looking for a forum to publish my structural and emotional comparison between the music and color harmonies.